A selection of Thomas Underwood sketches of scenes around New Street and the High Street. In my research into the history of St Paul’s Church in Birmingham, one of the most useful documents was Henry Kempson’s Notebook. 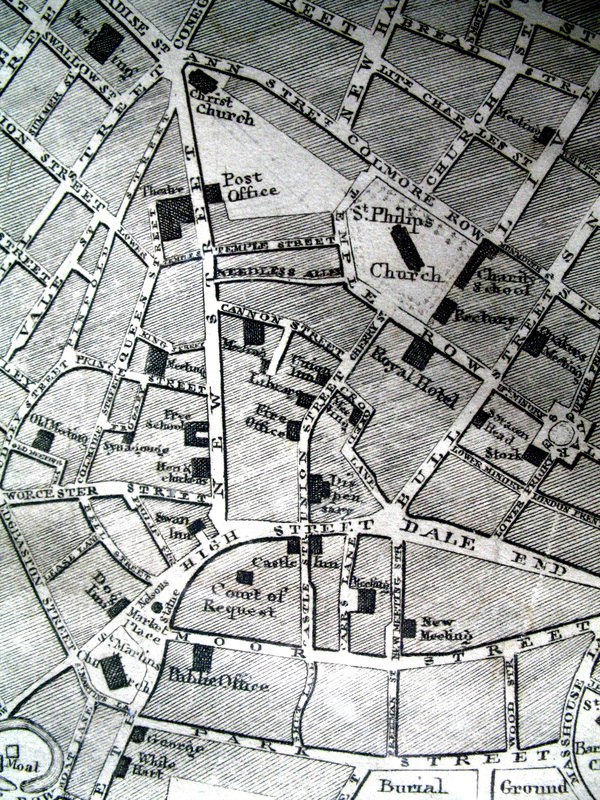 Henry was a surveyor who often worked with George Holloway, Charles Colmore’s agent, on the leasing of Colmore land. After the passing of the 1771 Act for the building of two new Chapels, they worked together on the building of St Mary’s Chapel and then later on the building of St Paul’s Chapel. In 1776 Kempson became, for a fee, the Secretary of the trustees of St Paul’s. Kempson had his own notebook with a heading “Memorandums relative to St Paul’s Chapel” which gives a detailed record of his activities. Perhaps the book is best known for the records of those who had, much earlier, committed to subscribe to the building of St Paul’s but who, as Kempson was calling to collect the money, were now declining to pay up for all manner of reasons. I began to feel sorry for the man. But then he would record that he was off to the Hen and Chickens for dinner with someone. The Hen and Chickens, where was that? I had not much idea where anything was. There, before my eyes, was the Hen and Chickens, in New Street. And much else besides. It occurred to me that this map could still be relevant to the period I had researched, the 1770s, and perhaps for some years after 1810. Fig 1 shows an enlarged selected area of the map including what may be described as the Town centre. 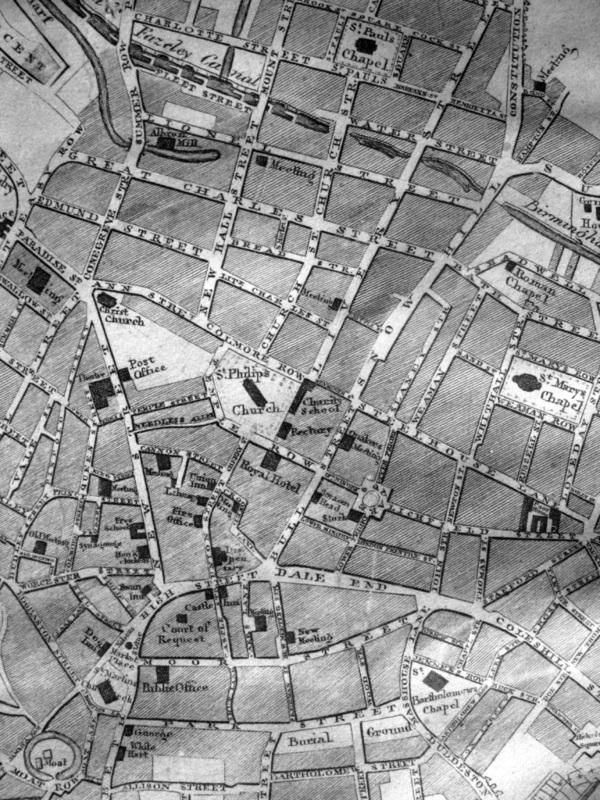 One particular feature is that it picks out the religious meeting places, covering the three Anglican Churches, including Christ Church just recently built in 1805, the three Anglican Chapels, a Roman Chapel, the Quakers Meeting House in Bull Street, a Synagogue in Frogary, the Unitarians at the Old and New Meeting Houses, the Congregationalists in Carr’s Lane and Livery Street, the Baptists in Cannon Street and the Congregationalists in New Hall Street. Then, naturally, there are the hotels, and public buildings. Fig 2 is a further enlargement of Fig 1, covering the High Street, New Street and surroundings. Looking at Fig 2, the present “House” numbering system on New Street starts from No. 1 at the High Street end on the Post Office side, up to 70 plus at the top end. It then crosses over to the other side and starts at No 80 and increases to about 150 at the High Street end. We will assume it was the same system in 1811. One evening at home, out of the blue, there was handed to me a book, dirty and distressed, about 38cm wide and 26cm high, with elaborate printing on the cover which read “The Buildings of Birmingham Past and Present Sketched and Described” and in small print “Drawn and Lithographed by Thomas Underwood Castle St High St Birmingham 1866 Published by Walter Sackett 11Bull St Birmingham” It was, literally, falling apart as the binding had gone. I decided to keep it but it was to be some time before I realised what it was about. I also realised that there was a “Second series” published in 1869 and after a search managed to find and acquire one. Again it was in poor condition being badly foxed in places. The principal contents of the books are sketches by Thomas Underwood. To quote from the introduction “…the aspects of our streets is changing so completely that, in a very few years, very few examples of our existing buildings will remain; and hence the interest and value of the sketches which this volume contains, as examples of the present and relics of the past”. It is not about churches and town halls and municipal buildings. It is about the streets and shops and pubs and perhaps some of the sketches show what it was like when Henry Kempson went to the Hen and Chickens. My objective is simply to reproduce here, over a period, as many of the sketches as I can. They will appear in a separate posting as well as “The Thomas Underwood Gallery”. This entry was posted in Birmingham History on April 28, 2015 by John Sawkill. John …What a brilliant find! Those engraving would be lovely if printed and framed; and one of them rang a very loud bell indeed. My City Major Scholarship to King’s Norton Grammar School entitled me too free text books … and where did we go to find them? Cornishes of course … Have a look at No 3, and there is the early shop of the same name … and next to Underhills! The Hen and Chickens looks a great place for lunch … when are we going? The maps too are fascinating …. This very same Thomas underwood is my great, great grandfather & I am trying to collect as much information as possible for personal use, I.e. Family history. If you possible have any information I would be very grateful if you could forward links etc. Your 3xgreat grandfather was a member of the Birmingham Book Club, an organisation which has existed in Birmingham since about 1745. Thomas Underwood was a member from 1859 to 1869. I guess he resigned as a member of the Club because he had been made bankrupt for the third time.